Many plants have flowers that help them to make seeds in order to reproduce. You can learn about these plants on our flowering plants page. However, some plants do not use flowers to reproduce. These plants are called non-flowering plants. There are two main groups of non-flowering plants. Plants that use spores to reproduce and plants that use seeds to reproduce. The non-flowering plants that use seeds are called gymnosperms. Gymnosperm means "naked seeds". They are called this because their seeds are open to the air with no covering such as the seeds of flowering plants. One of the major groups of gymnosperm plants is the conifer. The word "conifers" means "bearing cones." Conifers are plants that use cones to house their seeds. Conifers are woody plants and most of them are trees such as pine trees, firs, cypresses, junipers, cedars, and redwoods. Conifers reproduce using their cones. Some cones are male and some are female. The male cones release pollen. This pollen is carried by the wind. If the pollen lands on a female cone, then the female cone will produce seeds. The hard scales of the cone protect the new seeds as they grow. The seeds of a conifer are winged seeds. When they are released by the cone, they will float on the wind until they reach the ground where they will germinate and grow. There are some non-flowering plants that don't produce seeds. Instead, they use spores to reproduce. Spore producing plants include plants such as mosses and ferns. Spores are tiny organisms that usually contain only a single cell. Plants that make spores produce huge numbers of them. Because they are so small and light, they can be dispersed by the wind to new locations where they can grow. Mosses are soft and spongy plants that typically only grow a few inches tall. They tend to grow together in clumps. Mosses don't have flowers or seeds, but use spores to reproduce. They also don't have typical roots like most plants, but anchor themselves to rocks and soil with short growths called rhizoids. Another type of spore producing plant is the fern. Ferns produce spore casings on the underside of their leaves. These look like brown spots. At some point the casings dry out and the spores are released into the air. The leaves of ferns are called fronds. Scientists estimate that some species of ferns have been around for over 350 million years. 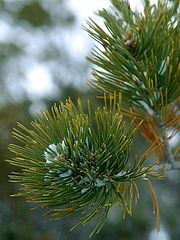 Conifers often have needle shaped leaves. Needles are tough, don't dry out, and will not easily fall off in high winds. This helps conifers to survive in cold, windy, and dry climates. There are over 12,000 different species of mosses. Mosses tend to grow in damp areas with plenty of shade.